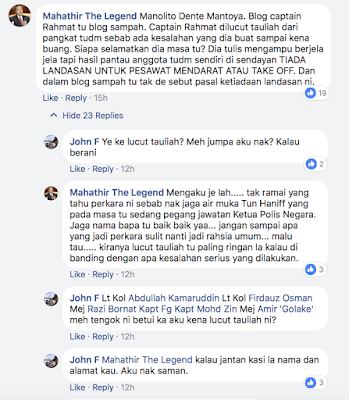 The Mole columnist* Abdul Rahmat Omar is lodging a police report against the handler of the Facebook account Mahathir The Legend for defamation and threats to cause bodily harm. Social media owners in Malaysia rarely involve the police in their war of words but in recent months that "war" has become savage and downright ugly. 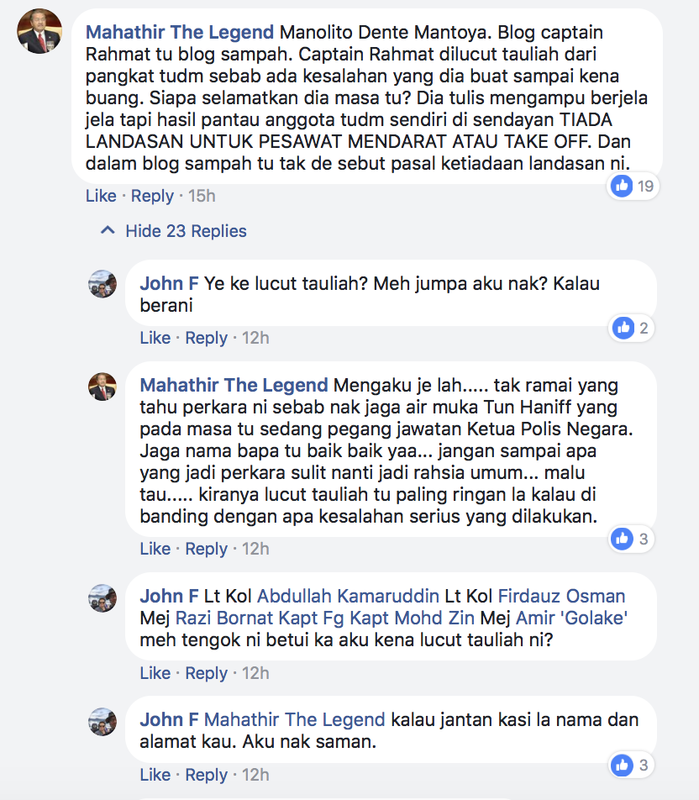 In his posting attacking Capt Seademon, Rahmat's popular nickname on social media, Mahathir had accused the columnist of having been stripped of his ranks when he was in the military and implied that he had used the influence of his father, who was the Inspector General of Police, to avert a worse fate than just to be stripped of his rank. Rahmat has challenged Mahathir to furnish proof of his allegations but the latter merely repeated the allegations. I am not a big fan of police reports and lawsuits against any kind of scribes, but I am even less of a fan when it comes to lies, half-truths and baseless allegations thrown at a fellow scribe, especially by someone who hides behind anonymity. I hesitated commenting since you seems to take too loooong, opening the comment box for viewing, by your readers and probably for yourself to read it too. But, the title your post... "Ex-IGP's son to lodge police report against Mahathir for threats"... made me change mind. Its outright misleading, somewhat malicious and seems evil towards the old man. I just hope that you're trying to swell the dwindling visitors to your blog. However, lets see whether Seademon has the guts to sue the admin of 'Mahathir The Legend'. Even "seademon" also you are supporting now, ptuuuuuih !